As I promised, here is the follow-up to “Fill Out Your Title Block with an iLogic Form”. There are a number of ways to improve and add to the information you may need to see in your Title Block. I am going to show you a few methods of how to customize your title block and add the entries to your Title Block Form. Before I begin, I would like to point out that this work should be done to the drawing template if you intend to use it on a regular basis. Make a copy of the template you intend to use, rename it, save it and edit that one. Above (Fig. 1) is an example of my title block and (Fig. 2) is an example of our goal of an iLogic Title Block Form. Most information is easy enough to find however, I have created a few Custom iProperties that are important to me for the way I work. (Fig. 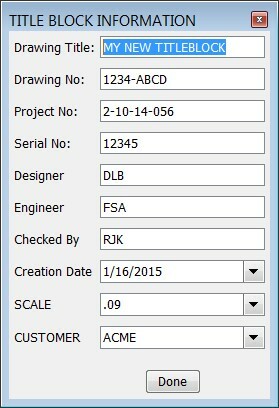 3) I have created Custom iProperty fields called “Customer”, “Drawing No.”, Drawing Title:”, “Project No:” and “Serial No:”. You can type in any place holder for each so we have information with which to work. Next we will create a few simple Rules. (Fig. 4) From the Manage tab go to the iLogic panel and click on the “iLogic Browser”. 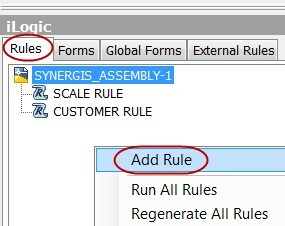 From the Rules tab on the iLogic Browser, right click and select Add Rule. Create a new rule called “SCALE RULE” which contains the following text. ‘This rule controls the scale of the stated view. Create a second rule called “CUSTOMER RULE” which contains the following text. ‘This rule transfers the user parameter customer to the Custom iProperty “Customer”. The advantage to this process lets you control the manner in which the Customer’s name appears, list contents and spelling of the customer’s name along with the list of the available scales. You can add or remove items from these lists just by editing the multi value parameters. The last of the upfront work involves configuring your templates title block with any new fields you would like to add. From my title bloc shown at the beginning of this article, you can see that I have customized and added fields that are important for my use. All of this work is being done to a copy of one of my production templates. I will rename this template when finished and save it in the correct location for day to day use. For this example, which can be used for all fields, I have created a label for my Customer field. (Fig. 7) From the Create Panel on the Sketch Tab, I select the text box and draw a rectangle under the Customer label.el. The Format Text window opens. (Fig. 8) Begin by selecting the correct Font and Font Size. Since we are working with a Custom iProperty, select the “Custom Properties – Drawing” from the Type pulldown. The Property pulldown gives you your choices of all the Custom Properties that you created. For our example, select Customer. Click the Add Text Parameter button to insert the Customer parameter. At the bottom of the window, click OK. You can change the size of the text box and reposition the text field to your liking. When you are finished adding fields, click the Finish Sketch button in the tool bar. This gives you the option of saving edits with the current name or with a new name. After you save your work, this should complete our prep work. Now that the upfront work is complete, we can move on to creating our Form. 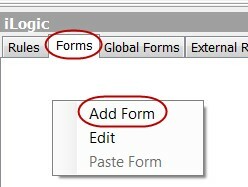 From the “iLogic Browser” select the Forms tab (Fig. 9), right click and select Add Form. The Form Editor will appear as pictured below. Above is the Form Editor. (Fig. 11) In the top right area (Design Tree) select Form 1 under the Label heading. In the Properties window lower right, click Label under the Name. Highlight “Form 1” and type “TITLE BLOCK INFORMATION”. From the Tabs section in the upper left of the window (Fig. 12), select the iProperties tab, drag and drop all desired fields onto the Design Tree. You will notice that as you drop your fields in the design tree, they are added to the Form preview at right. Any of these fields can be dragged up or down to resort the list. You can also change the spelling and case of any Label by selecting the field and changing its Label in the Properties window. When you are finished adding fields, click “OK” at the bottom of the window. A button with the label “TITLE BLOCK INFORMATION” is now in our Forms list. (Fig. 14) Click on the new button for the Form to open. With the SCALE pulldown, you can make changes to the scale of View 1. Remember to change the view number in the SCALE RULE to match the view number of the view you would like to scale in the drawing. That is it! All the RELEVANT information at your fingertips in one Form. You are welcome to suggest a topic that you would like me to address in a future article.